In a survey conducted by Pulse Asia from March 23 – 27, 2019 using face-to-face interviews, 10 Admin bets made it to the winning circle. They were: Villar, Angara, Go, Cayetano, Lapid, De la Rosa, Revilla, Marcos, Tolentino, and Estrada. 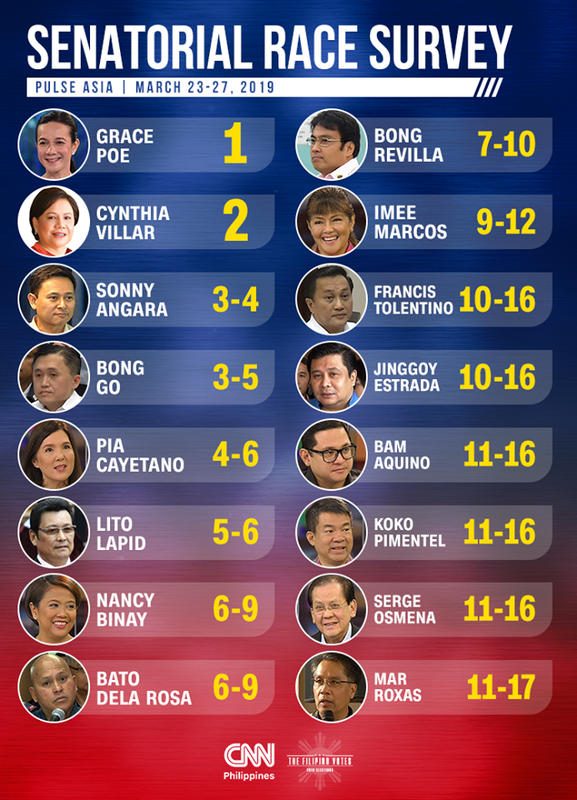 Poe continue to lead this poll while Binay was the other candidate to make it to the top 12. 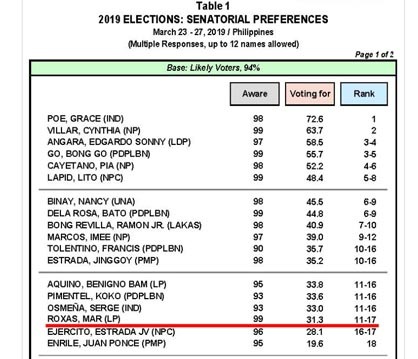 Those who did not make it to the top 12 but has the statistical chance of winning were: Aquino, Pimentel, Osmeña, and Roxas. 16. And in international news, the crash of a Boeing 737 MAX commercial plane in Ethiopia that killed all 157 passengers and crew members and the grounding of all Boeing 737 MAX airplanes around the world while the investigation into the cause of the crash is ongoing; the mosque shootings in Christchurch, New Zealand (NZ) on 15 March 2019 carried out by a lone gunman that resulted in the death of 50 individuals and injuries to 50 others and the reforms to the country’s gun laws announced by NZ Prime Minister Jacinda Ardern in the days following the attacks; and the physical defeat of the Islamic State of Iraq and Syria (ISIS) on 23 March 2019 by the US-backed Syrian Democratic Forces as ISIS lost its last stronghold in Syria.